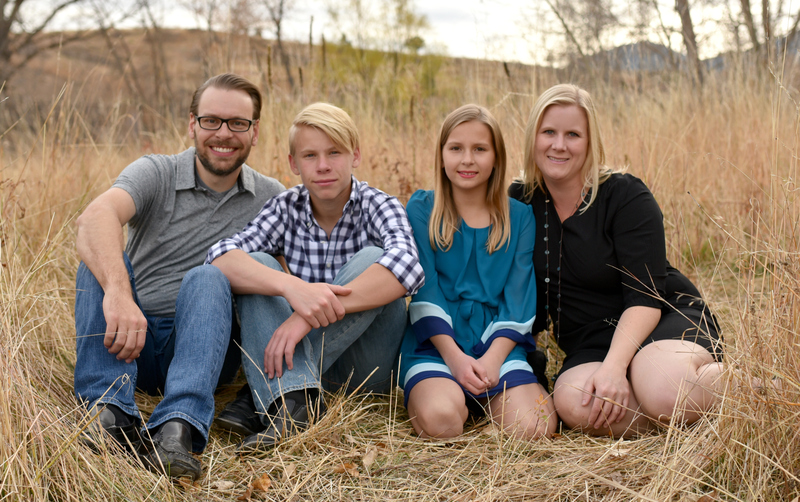 My son (and husband!) are tough on pants. 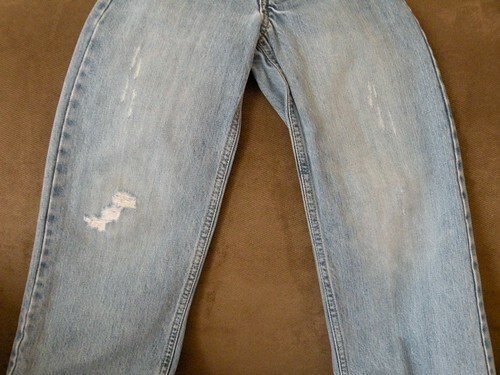 My rough-and-tumble almost-9-year-old son can put a hole in a pair of jeans in about oh, 5 minutes. 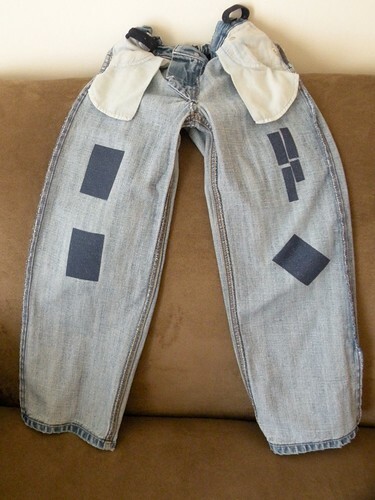 I have a quick no-sew solution for all these torn up pants. I know what you are thinking… “Iron-on patches? Those are so ugly! That is exactly why I iron them on the inside of the pants. 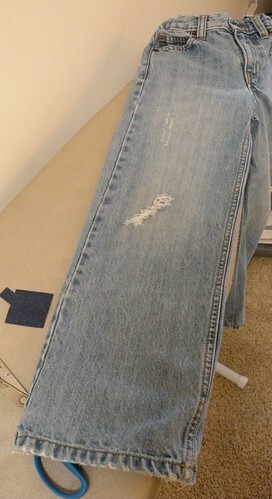 They are seriously so easy and only require an iron and about 2 minutes of my time. Just inside-out the clothing item that needs repair, position the iron-on patch, and you guessed it, iron it on. 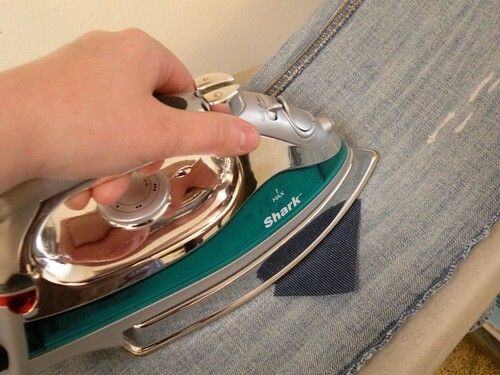 For smaller areas or weird shaped areas you can even cut the patch to the size you need before you iron it on. Yes, you still see the frayed area (but isn’t that the “in” look right now anyway?) 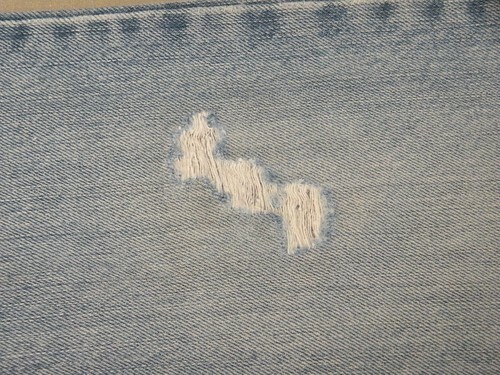 but now the hole won’t continue to grow and completely ruin your clothing item. Believe it or not, these patches hold up quite well in the wash.
As you can see, my son has been quite busy in the ruining-his-pants department. But after a few iron-on patches, those tears aren’t going anywhere. Now he has the “cool” look of worn pants without his pants actually wearing out and needing to be tossed. 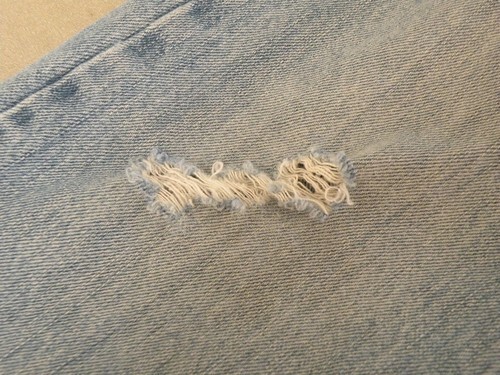 I’ve seen totally adorable ways to patch pants but they all involve sewing. Yes, I can sew, but honestly, I’d prefer to take the easier quicker way when it comes to mending clothes. You can purchase these iron-on patches at any fabric store, Wal-Mart, Target, etc. I think I’ve even seen them at CVS. Next time you get a little hole in your clothes, don’t toss them out. Patch them. 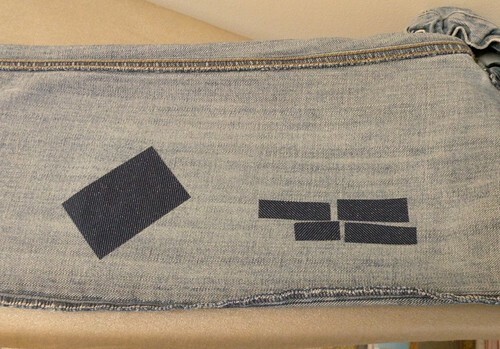 I’ve done that too Allison, only I used demnim from an old pair of jeans then sewed it on the inside, (’cause that’s free and cheap) but I hate sewing, so this is better! Glad to see you! 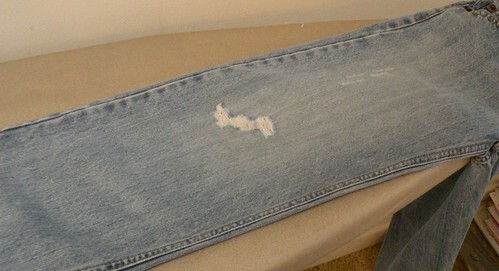 Great solution to patching the jeans!! I had to laugh though! I bought a pair of jeans that had the holes and such already in them. HA!! I’ve used this product and it works great! Thanks for the tip. Hope all is going well with escrow and your house buying adventure. Nice to see you back! That is a wonderful tip! Because a.) I can’t sew! and b.) my husband has the holiest (!) jeans on the planet. Thanks for such a thrifty idea! Yea! You’re back!! I was getting worried after the week-long hiatus, but I see that you haven’t given up in your homeless-stuck-at-mom-and-dad’s-house state. Oh, and as far as your post goes – love it! (I mean, I already do it – we think alike and grew up together)… but it works like a charm. Now, find a remedy for getting moth-holes out of cotton shirts. Those are the sucky ones. Simple fix! Thanks for linking up to Mad Skills Monday! Great project, I need some of those!! 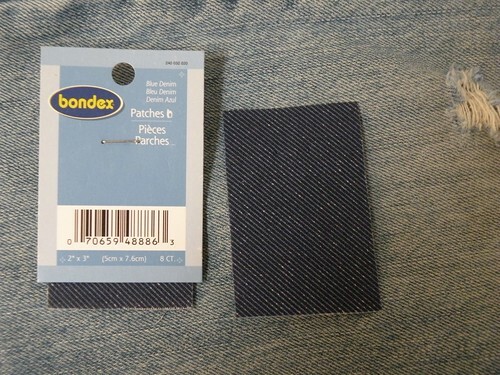 My mom can sew like a house on fire but she always used iron on patches to patch the holes in my jeans so the pants would last long enough to be handed down to my younger sib. Another trick she did is to turn a pair of pants with a hole in the knee into shorts.